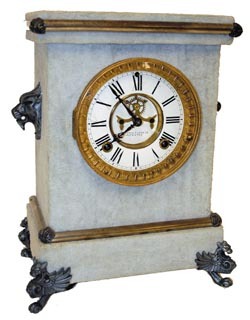 Ansonia Clock Co. "Plush Clock - Florentine, No. 3", C. 1886. This is one of a series of 6 plush clocks made by Ansonia. This one came with or without a figure on top, and in different colors of plush cloth. It is evident this case never had a figure on top. The gray clock with gray metal trim is excellent. It is 13.5" high, lions heads on the sides (no rings), and 4 winged dragons for the feet. The company didn\'t cut corners on the dial or movement. The movement is 8 day with patterned brass plates, strikes hour and half hour on a cathedral gong. It has enclosed spring barrels, and a correct pendulum. The dial is 2 piece, faint hairlines around the 9, correct hands, open escape mechanism, brass sash, beveled glass, all very nice and is running well. Ly-Ansonia #2414.